Eating 3 sounds like real lip service to a diet. I bet the G.O. and your Dad both enjoy them. My sister in law is making me a cake this year. It’s one of the very few cakes I actually eat and quite enjoy. I’ll have a slice and think of you both, but the marzipan is mine. Real time, real life blogging has its challenges but I put myself on the line for authenticity! I’m not a big fan of the usual fruitcake… even when I made them from scratch BUT these look delicious! Thank you 🙂 I prefer light fruit cake, that said I’ll eat any sort as long as it’s homemade and not drowned in alcohol. Oh, also wanted to say that your ‘Nana’ looked like a very sweet person! Thank you again 🙂 She was sweet but no-nonsense apparently… I can’t remember being anything but loved. I see some of her traits when I look in a mirror. I love looking at hand written recipes from that era. My mother has an identical script. I may have learnt that way, but it has changed over time. No, the farmers would have used butter for sure- they were all quite hostile to ‘marge’ taking over. The reference to ‘Nasho’ is also of great interest. Eating little Christmas cakes for breakfast sounds very sensible- it is a weekend thing. I just ate some apricot crumble, two serves, as Mr T went to the loacl shop for the ‘Age’. All bad news on the front cover, so I am happy to read your lovely post instead. My aunt also writes in that script, I had to ask her whose handwriting it was. I have messy handwriting like Dad. We don’t hear much about Nasho’s these days. Sometimes I wonder if a year of NS wouldn’t be a good thing. I well earned those cakes… after I finished all the Saturday morning stuff at home, I walked 5+ km doing errands, the last part carrying weighty shopping bags! I’m not sure if I’m strange or what, but part of my reason for posting recipes online is to keep my memories of Mum alive. She only cooked Hungarian food so not all the recipes are hers, but the blame for teaching me to love good food is definitely hers! One day we should put together an anthology of tried and tested family recipes – one per author. How many do you think we’d get? Thank you. I’m the only one of the grandchildren who knew Polly so she’s really special to me. That’s the first ever family recipe I’ve made from something written down. I’m happy to contribute it to an anthology 🙂 Mainly I attempt to recreate memories. We were lucky to have family that gave us good food experiences rather than visits to fast food outlets! I am definitely going to start giving this anthology idea some serious thought. Just need to make sure it can be done successfully in an ebook format. Like you, I have treasured copies of pages from my mother’s cookbook, but unexpectedly last year my younger sister told me she had my mother’s original cookbook – a surprise, since she’s not an enthusiastic cook. I claimed it, not because I particularly need the recipes, but because I hadn’t seen my mother’s eccentric handwriting for years and it was a huge nostalgia trip, evoking all sorts of ghostly smells and tastes! Wow, your Mum’s handwritten cookbook would be wonderful to have. I was bit teary this morning when I realized the fruit cake was indeed familiar: a cookbook would bring me completely undone! Other than the fruit cake recipe I have no idea what others my aunt has… Dad had said he’d give me the Commonsense Cookery Book that belonged to Nanna, a gift 45 years ago from him, mum and I where mum has written on the flyleaf, however when I suggested it for my upcoming birthday he said “but what will I use then”… so we’ll see! It’s an interesting time capsule too. She had a habit of tucking into it recipes she cut out of newspapers, handwritten notes from her friends, drawings, advertisements and flyers. It’s a treasury of 1950s and 60s ephemera! Thank you 🙂 I just couldn’t bring myself to use margarine. Maybe one day I’ll try it out of curiosity. I remember when margarine was new, trendy & healthful, and I really tried but I was pleased when Atkins made butter better! 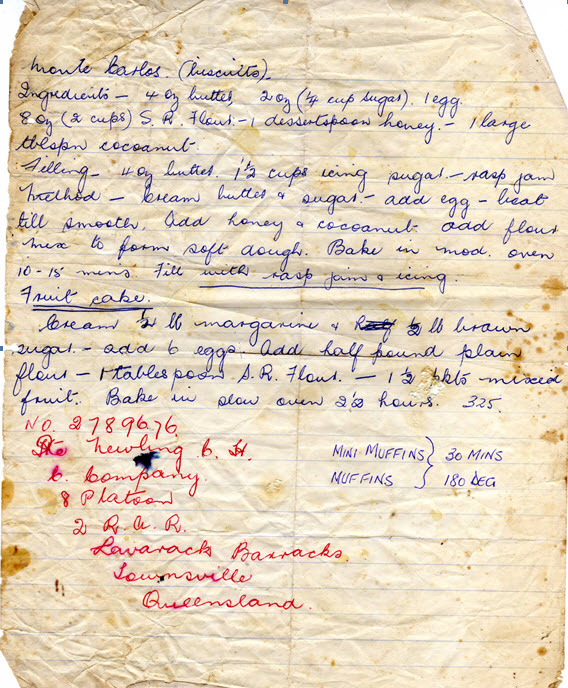 Those old hand written recipes are a treasure and bring back so many memories. Your Nanna’s fruit cake recipe looks good. I would use butter. It is wonderful, and made me curious as to if anyone in the family has any other’s tucked away… I shall investigate… but cautiously… food memories as well as being wonderful can be contentious as with the margarine, and my uncle’s attempt to recreate Nanna’s egg salad dressing, which he declares is the same but no-one agrees! It’s been many years since we had margarine in the fridge. The cakes at their best warm, next time I’ll make sure the G.O. 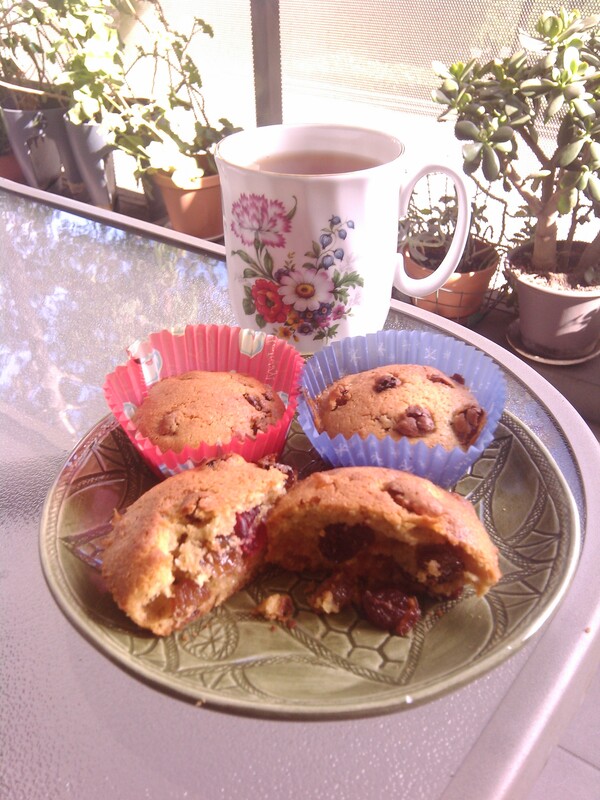 is home when I bake them but he’s happy enough to take them to work for smoko. It’s not baking weather, but in Sydney we have aircon and I did have it on while the oven was on. Otherwise it wouldn’t have happened. Our TA neighbours reported 45 degrees yesterday. In my early years there we had a Christmas eve where it was that and I was trying to roast a turkey… first & last time! Aww … How lovely to have a copy of that original recipe from your grandmother. Reminded me of a Ginger Biscuit recipe MIL#2 gave me once, and I’m very sad to say, I’ve lost. I read your other post on the 3 x MILs and was smiling – oh the bath mat thingy. I’ve only had 2 as my current husband’s Mum was already deceased when I met him, but sounds like you’re well able for the challenges. Lovely posts as always, Ella. Thank you 🙂 The past may be just that but its food and memories linger, and just maybe we can create stories from it, so it lives on once again in different form.